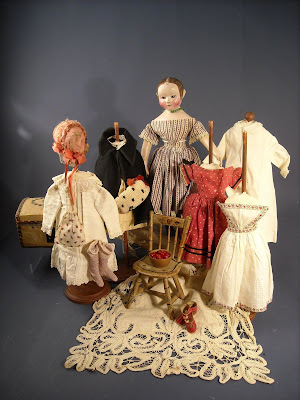 It's the mission of this blog to provide wonderful images and information about original Izannah Walker dolls to those of you who love Izannah dolls. 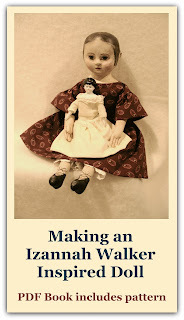 I love it when I open up my e-mail and I've received some wonderful fresh, new pictures of Izannah Walker dolls to share! 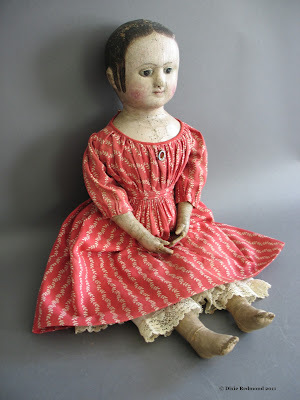 Larry of Withington Auction, Inc. sent these pictures and information, and I'm happy to post the pictures here of this astounding Izannah Walker doll with an amazing provenance! In the Pope Family for 148 years! Elizabeth Coggeshall Pope was born in New Bedford, Mass on October 26, 1857. 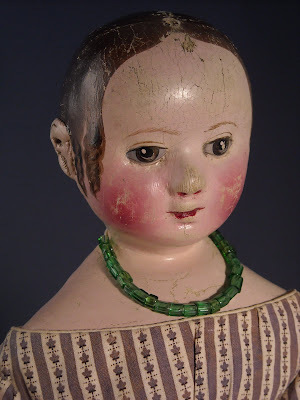 Given to little Elizabeth at her birth, the doll called ELLA, is an example of Rhode Island doll-maker Izannah Walker’s earliest works. William Pope married Anna Coggeshall in 1836, and together they had six children, only one son, Edward Ritchie Pope – lived to maturity. Edward’s younger sister, little Elizabeth died at 2 ½ years from scarlet fever. The doll named Ella, was preserved in her memory, descended through the Pope family to the present. The child’s maternal grandmother was Elizabeth Brown of Providence, RI- the Browns were among the first settlers of the Rhode Island Colony. Izannah Walker’s Doll shop, located in Central Falls, RI, was not far from Providence and the doll was probably a gift to Elizabeth from her Rhode Island grandparents. 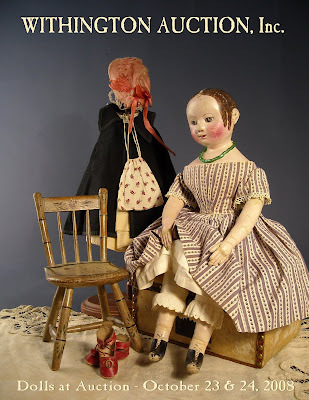 Izannah Walker registered a patent for her dolls in 1873, Ella is an example of her earlier work, having applied ears, and the fact that the owner, Elizabeth, only lived from 1857 to 1860, confirms the date she was made. Ella comes with a wardrobe, and accessories, including a bonnet, traveling cape & muff, and an extra pair of red “French slippers” with striped stockings. Her condition is exceptional, in all original paint with a bit of wear and light crazing. In addition to the wardrobe, she has a paint decorated country chair which bears a date of 1824 on the bottom. Anne Stuart Hodgson of Minnesota is the fifth generation of Popes to own this special doll. Having no heirs, the family has decided it is time to find a proper home to care for her for the next century. Withington Auction is honored to be able to present ELLA to the world. She will be sold at auction on Thursday, October 23, 2008 at the Holiday Inn in Nashua, NH. For more information please visit at www.withingtonauction.com or call 603-464-3232. Thanks for sharing your knowledge and pictures, Dixie. I have always loved these wonderful dolls, but living in Australia, I have never seen one in real life. Along with Kathe Kruse, and Sasha Morgenthaler, I count Izannah Walker as one of the major influences in my own dollmaking. Thanks for sharing this info and photos. 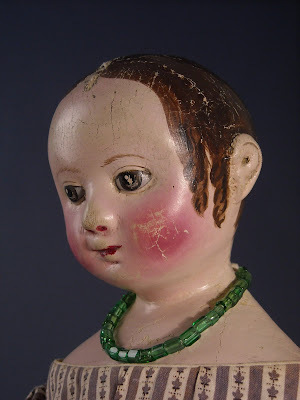 I was at Wenham last week looking at the Izannah and the Columbian dolls, Chase dolls, etc. in their collection. Once again I was dazzled. Lucky collector who wins this doll and trousseau that you have posted. One can only dream! Would you mind if I put a link to this blog on mine? Thought I should ask first. Such a wonderful doll and the story of her life is intriguing as well. Do you not think that the cut of her brown frock is very similar to the one I have that you admired! Did you get to the Strong museum this past summer to see the Izannahs there? I really hope I can go to this auction!